It’s hard to stay healthy these days but with the arrival of the green smoothie diet, you can keep the excess weight off without any heavy lifting. 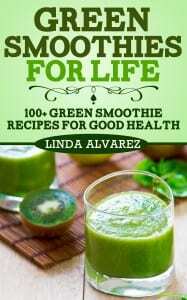 There are over 100 green smoothie recipes for any occasion as well as tons of helpful tips to perfecting green smoothies and living a healthier lifestyle overall. Linda Alvarez is a nutritionist who would love to see people live healthier, fuller and happier lives. Her new book “Green Smoothies For Life” was written to help those desperate for wanting to live a healthier life without too much hassle. Ms Alvarez is also a keen yoga student and pianist.